At The Workplace we often get issues where people need to deal with issues that are controversial or the issues are sensitive to certain people. These questions often result in storms of comments that are little more than opinion sharing, and arguments often about a tangential issue, or the goal of the question itself. These goals are usually not illegal or immoral but rather there are camps of people who believe that no one should want to achieve them because of personal opinions. We discussed this request internally a few weeks back, and then I kept my eyes open with it in mind. Responses to the question have already gone off the rails. All of the proposed notices here serve only to remind readers of things they should already be keeping in mind when responding to questions. Or responding to anyone, anywhere, ever. The only reason we'd need a special notice is that things have broken down to the point where an extra reminder is needed. It's worth mentioning comments as well. In fact, comments seem to spin out of control a lot faster than answers in these scenarios, so I'm kinda inclined to focus on them more than answers... But realistically, soapboxing in either venue is a problem and we need to discourage both. The notice needs to get to the point, fast. If folks are already inclined to ignore basic etiquette because they feel it's sooo important to jump on their soapbox FOR THE GOOD OF HUMANITY... There's already a good chance they're gonna ignore anything meant to discourage that. Subtle, passive, lengthy reminders and links to other pages aren't gonna cut it - we need to convince readers that soapboxing is going to be a waste of time in as few words as possible. This notice is now live on The Workplace and Interpersonal Skills. If it proves effective, it can be added to other sites as-needed. Yes Please! This IPS Moderator would love this, too! In our short ~100 days on Interpersonal Skills we have had several posts with root problems that relate to extremely divisive issues but the issues being discussed are often irrelevant to the interpersonal interaction and answers and comments that only tell the OP that their choices are wrong while ignoring the question aren't useful. We have since created a site policy that answers should respect the decisions that the asker has made and not try to change their minds. This is described in my answer to the meta question To what extent do we respect the OP's request? This policy is based on a similar one on Parenting: What should we advise when one disagrees with the premise of a question? So, in addition to having this extra post notice, I would like to request that we be able to link it to our meta post on the topic (if applicable) so that we can point users to the specific site policy in addition to (or instead of) the general "Be Nice" policy. Since these policy links are unlikely to change, I'm guessing this is something that can be done per-site but doesn't need to be moderator configurable. We can give the CMs/Devs a link if that's simpler. I would very much like something like that too. As an active user on the workplace, we often times get questions where a bit of sensitivity and more general niceness is needed. We don't usually shy away from controversial topics, so a notice to make it abundantly clear that discourse on these needs to be respectful would I think serve to make some people think twice before posting, which is sorely necessary on these topics. Not the answer you're looking for? Browse other questions tagged feature-request support status-completed post-notice specific-site . What about site-specific post notices? 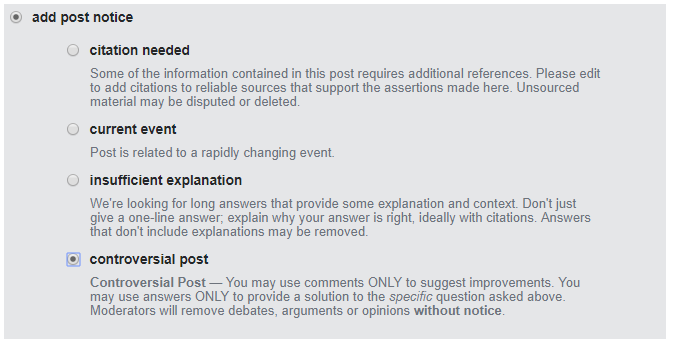 Could we please rename the Controversial Topic Post Notice?